An advertisement came on. 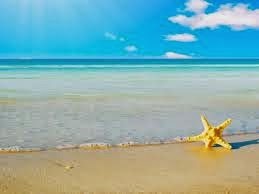 It boasted images of beautiful beaches and expressed this basic message: "beaches are all different. But every beach has beer in common". Being a literal person, the first thing that came to mind is what a lie that is...lots of beaches ban alcohol. It makes sense to me that an alcohol company would be advertising alcohol...but why resort to a lie to sell it? Yet this is a strategy that people use everyday, not just corporations. How often do we tell little lies? And why do we do it? We're told in the Bible to uphold the truth. We're told that the truth is light that dispels darkness. That the truth sets us free. And then we tell little lies. You know, just the type that make things sound better than they are, or that twist facts in our favor. We tell lies that help us avoid confrontation -something so common it has a label: a white lie. It's our hope that our reasons are so good that these little bits of deception are acceptable. But they aren't. The purpose of our little lies is always, ultimately, for ourselves. We don't want to be liars -we just don't want to lose whatever it is that we're guarding with our lies. We don't often lie by saying outrageous things or weaving big webs. A little twisting, a little silence, a few blanks in conversation lined with implications...these do the trick. Such lies don't hurt anyone else, we assume. They certainly don't hurt us! Lying is not only a sin, according to the ninth of the ten commandments, but it draws out the sorts of things in our hearts that the Lord finds detestable. These are the sorts of things that cause our feet to stray from His righteous path, as we look not on who we're following but on where we want to get to. To tell little lies is to do away with integrity, valuing "righteousness" only when it's convenient. Little lies evidence that in our hearts, we don't trust that God can achieve or provide or make a way for us without the aid of our deceptive powers. A little lie says "Lord, the right way isn't enough to get me where I want to be, so I'm doing it another way that is, well, not right but not wrong." There's no such thing. It's His way, or the wrong way. That's it. There are no terms to negotiate or compromises that are acceptable. "Whoever can be trusted with very little can also be trusted with much, and whoever is dishonest with very little will also be dishonest with much. So if you have not been trustworthy in handling worldly wealth, who will trust you with true riches? And if you have not been trustworthy with someone else’s property, who will give you property of your own? The Pharisees, who loved money, heard all this and were sneering at Jesus. He said to them, “You are the ones who justify yourselves in the eyes of others, but God knows your hearts. What people value highly is detestable in God’s sight." Little lies are born of little faith. They betray our heart's preference of gain over obedience and righteousness. Though we find all sorts of ways to justify little lies, enough is enough. God knows our hearts. He is willing, eager, and certain to make a way for us that doesn't require the sin of lying. Give it up and have faith that the honesty He so values -even in the littlest things- is worth it.